Going green and being eco-chic has never been so much fun…I love unique and creative accessories and ECOcentric Bags certainly deliver with Maggie Bags. Maggie Bags are made entirely of recycled seatbelt webbing that would have been headed to the trash bin because the brand new webbing had a slight color variation. I was amazed at the durability of the Maggie Bag and it is so sophisticated and stylish. I proudly wore my Maggie Bag at a play that I attended with my children. I had three compliments within minutes from ladies at the theatre who wanted to know about the bag. They were shocked and impressed when I explained that it was made out of recycled seatbelts. My Maggie Bag had a pretty purple lining with room for my cell phone, wallet, pen and keys. My favorite feature of the Maggie Bag is nickel plated feet on the bottom. The Maggie Bag is available in tan or orange (perfect for Autumn) and retails for $59.95. 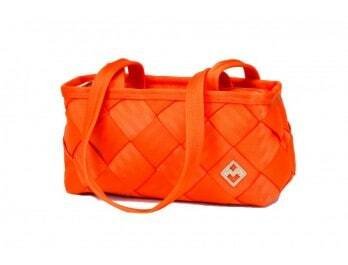 The selection of eco-friendly bags and totes are amazing at ECOcentric Bags. I really liked the Envirosax Kids Series, “To The Moon”. My kids were thrilled to have their own reusable bag at the Farmers Market over the weekend and actually fought to have the right to carry the bag stocked full of fruits and veggies. 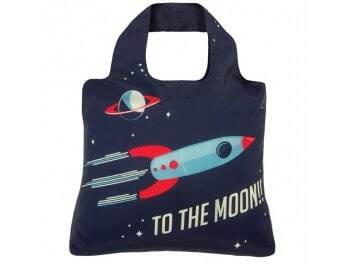 I liked that this gives children the chance to be eco-conscious and have their own fun tote too. At only $8.95 it is a bargain. Have fun browsing the selection of handbags, lunch bags, produce bags, totes and backpacks at ECOcentric Bags. 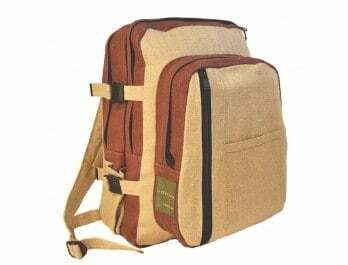 I am gazing longingly at the Ecolution Trekker Hemp Backpack….which one do you like best? Right now ECOcentric Bags has a special running on their Facebook page. When they hit 1,000 fans everyone who “likes” them will get 40% off all their bags…that’s a super deal so hurry over and check it out.